The Farmer's Daughter block is an easy choice for the beginner quilter. It is a five patch quilt block (so described as it is designed on a 5 x 5 grid), but I choose to construct it as an uneven nine patch because I like to work in "chunks" rather than in rows. However, if your preference is to sew it in rows, then you know best. 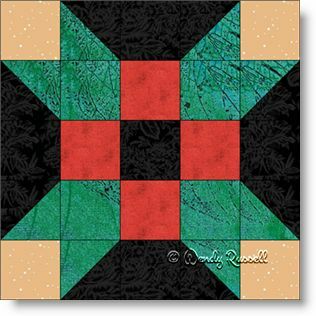 I described this as an easy block because it contains only the most basic quilt patches -- the square and the half square triangle, which is the first pieced patch you learn in your quiltmaking journey. As you can see from the two sample quilts illustrated, just because a block is described as "easy" does not mean you will make a boring quilt. By adding extra shots of colour with blank blocks to showcase your quilting skills, you can make an entirely different quilt than one with only sashing added as an extra element. Nothing limits the making of a stunning quilt other than your imagination!